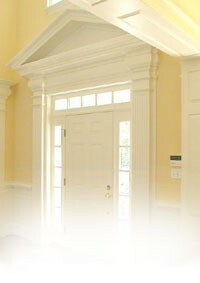 Entrance Hallway: Crown mouldings. Chair rail. Staircase to second level. Coat closet. Access to living room and dining room. Living Room: 20’1” x 13’3” Crown mouldings. Fireplace with slate hearth and surround. Gas logs. Opens into family room. Dining Room: 13’1” x 13’ Crown mouldings. Chair rail. Please note: Dining room chandelier shall not be conveyed. Kitchen: 15’2” x 11’7” GE Monogram 5-burner gas cooktop. GE double wall ovens. KitchenAid dishwasher. Samsung French style refrigerator/freezer, which shall be conveyed. Stainless sink with Insinkerator disposal. Moura marble countertops. Moura marble-topped island with storage below. Raised counter for bar seating. Recessed lighting. Ceiling fan. Opens to informal dining area. Informal Dining Area: 17’ x 16’2” French door to rear gardens. Plantation shutters. Recessed lighting. Ceiling fan. Family Room: 21’8” x 13’ Carpeting. Crown mouldings. Fireplace with raised brick hearth and surround. Built-in book shelving with cabinetry below. Wet bar with stainless sink. Wine storage rack. French door to playroom/office. Recessed lighting. Playroom, Office or Work-Out Room: 18’3” x 14’2” Mini split heating/cooling system. Carpeting. Crown mouldings. Built-in book shelving with cabinetry below. Recessed lighting. Ceiling fan. Half-Bath: Hardwood flooring. Pedestal sink. Chair rail with wainscoting below. Hallway: Closet. Access to walk-up attic. Master Bedroom: 17’9” x 15’6” Two double closets. Plantation shutters. Chandelier, which shall be conveyed. Master Sitting Room: 16’2” x 8’2” Plantation shutters. Master Bath: Updated! Ceramic flooring. Corner oval jetted tub with ceramic surround. Shower with ceramic surround. Double vanities with drawers and storage below. Linen closet. Built-in medicine cabinet. Plantation shutters. Bedroom #2: 16’6” x 13’3” Walk-in closet. Ceiling fan with light. Private Full Bathroom: Ceramic flooring. Shower with ceramic surround. Pedestal sink. Bedroom #3: 13’ x 13’ Closet. Ceiling fan. Full Hall Bathroom: Ceramic flooring. Tub/shower with ceramic flooring. Pedestal sink. Bedroom #4: 13’ x 10’9” Closet. Ceiling fan with light. Lower Level: Wood-grain ceramic tile flooring. Sump pump. Please note: lower level refrigerator shall not be conveyed. Laundry: Double laundry sink. Samsung front load washer/dryer, which shall be conveyed with property. Huge dedicated playroom, office, or exercise room! Partially finished basement for multiple purposes. Exercise equipment will be conveyed! Within walking distance of Mary Munford School! Cooling: 2-zone central air with internet-enabled thermostats + mini-split in playroom.